Elite 2000 is positioned between Elite 750 and Elite 2500 and is aimed at tuners who want more features than the Elite 750 but don’t need all the additional race functions available in the Elite 2500. Includes: Elite 2000 ECU, Premium Universal Wire-in Harness with firewall grommet, moulded 6 power circuit Haltech fuse box and lid (4 relays and 7 fuses). Also includes pins for the 2 spare power circuits, USB Software Key and USB programming cable. This ECU is positioned between Elite 750 and Elite 2500 and is aimed at tuners who want more features than the Elite 750 but dont need all the race functions available in the Elite 2500. 8 x Fuel Injection Outputs. 8 x Ignition Outputs. 12 x Digital Outputs. 10 x Analogue Voltage Inputs. 4 x Synchronised Pulsed Inputs. 4 x Dedicated Inputs (Dual Knock, ignition Switch & Internal MAP Sensor). 2 x Dedicated Engine Position Inputs with extensive trigger type support. Programmable Injector Peak and Hold Currents. ESP Calibration Software Intuitive and easy to use. Dual CAN Bus communication for OBDII and Haltech CAN Expansion. OBDII Compatible Set and clear diagnostic trouble codes, view live engine data. Variable cam control Independently control up to 2 Intake camshafts. Short and Long term fuel, cam, boost and idle control learning. Dual Channel Knock Control with high speed digital filtering for accurate detection. Multi-fuel Support Support for Petrol (Gasoline), LPG, Methanol and Ethanol. E85 Flex Fuel Ready Direct connection to sensor. Closed Loop 3D Boost Control Multiple Modes Tune by gear, wheel speed or time. Nitrous Control Wet, Dry or progressive with 3D Fuel and ignition corrections & On/off delays. Closed Loop Idle Control With learning for consistent idle stability. Closed Loop 02 Control Dual bank control. (with optional external CAN O2 Wideband Controller Kit). Anti-Lag/rotational idle and Launch Control Drag and Rally modes. Rolling Anti-Lag Fixed or current, RPM or road speed. Data logging 1 MB internal memory Up to 20 channels of logging. Sampling rates up to 50ms (20Hz) & external laptop logging using available hard drive memory. Engine Protection Set limits for sensors and protect your engine. Internal 3 Bar MAP Sensor (29 psi max boost). 8 x Current controlled injector drivers. High or Low impedance injector compatible. Programable Peak Current 0A 8A. Programable Hold Current 0A 2A. All spare injector outputs can be used as generic DPOs with 1A Max output. 8 x Over current protected ignition drivers. Max current 1A per driver. All spare ignition outputs can be used as generic DPOs with 1A Max output. 5 x Over current protected low side pulsed outputs. 1 x Dedicated engine control relay output which can control up to 6 relays simultaneously. 1 x 4 wire stepper motor control. Can be configured as 4 x hi / low side outputs. Max drive current 1A per output. Max sink current 1A per output. 2 x Dedicated Knock Inputs. Supports piezo knock sensors. Synchronised to engine position. 2 of which are compatible with narrowband O2 sensors. Switchable 1K Ohm Pull-up resistor for sensors. Can tolerate up to 20V Max input voltage. Supports up to 1.5KHz input frequency. 2 x Engine Position Inputs with extensive trigger type support. Supports variable reluctor and digital inputs. Supports digital inputs ONLY. Supports variable reluctor and digital sensors. Measures duty cycle, frequency or state of a signal. Can tolerate up to 25V Max input voltage. 3 Bar Internal MAP Sensor rated up to 200kPa of Boost (2bar/29psi). 2 x CAN Bus communication for Haltech CAN Expansion and OBDII. 1 x USB Connection for Programming. Data logging, Up to 20 channels of logging. Fastest Sample Rate 50ms. We (BRE) Brangers Racing Engines are the manufacture the machinist & engine builders not just a parts store! We know the proper clearances we own and know how to read micrometers and dial bores gauges. We have a complete 11,000 sq ft machine shop with 2 SuperFlow engine dynos as well as a Mustang chassis dyno. 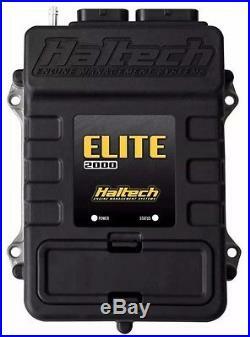 The item “Haltech HT-151204 Elite 2000 ECU + 2.5m (8 ft) Premium Universal Wire-in Harness” is in sale since Friday, April 21, 2017. This item is in the category “eBay Motors\Parts & Accessories\Car & Truck Parts\Computer, Chip, Cruise Control\Engine Computers”. The seller is “brangersracing9352″ and is located in Elizabethtown, Kentucky. This item can be shipped to United States, Canada, United Kingdom, Denmark, Romania, Slovakia, Bulgaria, Czech republic, Finland, Hungary, Latvia, Lithuania, Malta, Estonia, Australia, Greece, Portugal, Cyprus, Slovenia, Japan, Sweden, South Korea, Indonesia, South africa, Thailand, Belgium, France, Hong Kong, Ireland, Netherlands, Poland, Spain, Italy, Germany, Austria, Israel, Mexico, New Zealand, Singapore, Switzerland, Norway, Saudi arabia, Ukraine, United arab emirates, Qatar, Kuwait, Bahrain, Croatia, Malaysia, Brazil, Colombia, Panama, Jamaica. 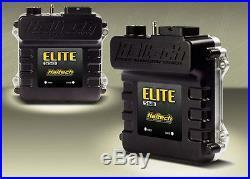 Tagged: elite, haltech, harness, ht-151204, premium, universal, wire-in. Haltech Elite 550 is here! 1 to 8 cylinder engines or 1 to 2 rotor engines Normally aspirated or forced induction. Waterproof Case (IP67) (with USB Cover Fitted) 34 Position AMP connector 4 x Fuel Injection Outputs Peak And Hold (0-8A Peak / 0-2A Hold) 4 x Ignition Outputs 2 x Engine Position Inputs with extensive trigger type support 1 x Digital Pulsed Input 5 x Digital Pulsed Outputs 2 x Analogue Voltage Inputs 1 x Throttle Position Input 1 x Coolant Temperature Input 1 x Air Temperature Input 1 x CAN Bus communication for Haltech CAN Expansion Internal 3Bar Map Sensor rated up to 200kPa of Boost (2bar/29psi) ESP Calibration Software Intuitive and easy to use User definable tables Closed Loop O2 Control Sequential, semi sequential, batch or multipoint injection patterns Distributor ignition systems, multi-coil systems or Haltech Multiplex CDI systems Load sensing by: Throttle Position (TPS), Manifold Absolute Pressure (MAP) or Mass Air Flow (MAF). 4 x Current controlled injector drivers, high or low impedance injector compatible 4 x Over current protected ignition drivers 5 x Over current protected low side pulsed outputs 2 x User definable analogue voltage inputs 1 x Digital Pulsed Input 3 x Function dedicated analogue voltage inputs: 1 x Coolant temperature 1 x Air temperature 1 x Throttle position sensor 2 x Engine position inputs with extensive trigger type support 1 x 3 BAR internal MAP sensor. 1 x CAN Bus communication for Haltech CAN expansion 1 x USB connection for programming. We custom build 2JZGTE engines and manufacture many custom parts for the Toyota 2JZ. We want our customers 100% satisfied. The item “Haltech Elite 550 series with 2.5m (8 ft) Premium Universal Wiring Harness Kit” is in sale since Saturday, September 03, 2016. This item is in the category “eBay Motors\Parts & Accessories\Car & Truck Parts\Computer, Chip, Cruise Control\Engine Computers”. The seller is “brangersracing9352″ and is located in Elizabethtown, Kentucky. This item can be shipped to United States, Canada, United Kingdom, Denmark, Romania, Slovakia, Bulgaria, Czech republic, Finland, Hungary, Latvia, Lithuania, Malta, Estonia, Australia, Greece, Portugal, Cyprus, Slovenia, Japan, Sweden, South Korea, Indonesia, Taiwan, South africa, Thailand, Belgium, France, Hong Kong, Ireland, Netherlands, Poland, Spain, Italy, Germany, Austria, Israel, Mexico, New Zealand, Singapore, Switzerland, Norway, Saudi arabia, Ukraine, United arab emirates, Qatar, Kuwait, Bahrain, Croatia, Malaysia, Brazil, Colombia, Panama, Jamaica. 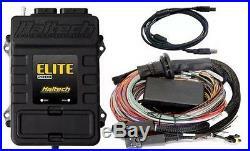 Tagged: elite, haltech, harness, premium, series, universal, wiring. The Elite 750 ECU is powered by the Elite Software Programmer (ESP) a powerful yet intuitive software that brings with it levels of functionality and ease of use never seen before in an engine control package. 1 to 8 cylinder engines or 1 to 3 rotor engines. Normally aspirated or forced induction. Waterproof Case (IP67) (with USB Cover Fitted). 34 Position AMP connector. 6 x Fuel Injection Outputs Peak And Hold (0-8A Peak / 0-2A Hold). 6 x Ignition Outputs. 2 x Engine Position Inputs with extensive trigger type support. 2 x Digital Pulsed Inputs (Digital inputs only supported). 5 x Digital Pulsed Outputs. 2 x Analogue Voltage Inputs. 1 x Throttle Position Input. 1 x Coolant Temperature Input. 1 x Air Temperature Input. 1 x CAN Bus communication for Haltech CAN Expansion. Internal 3Bar Map Sensor rated up to 200kPa of Boost (2bar/29psi). ESP Calibration Software Intuitive and easy to use. Multi-fuel Support Support for Petrol (Gasoline), Methanol and Ethanol. E85 Flex Fuel Ready Direct connection to sensor. Closed Loop O2 Control. ECU comes fully enabled, no additional charges for advanced features. Sequential, semi sequential, batch or multipoint injection patterns. 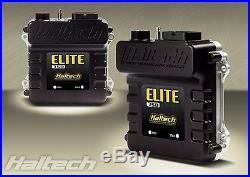 Distributor ignition systems, multi-coil systems or Haltech Multiplex CDI systems. Load sensing by: Throttle Position (TPS), Manifold Absolute Pressure (MAP) or Mass Air Flow (MAF). 1 x Internal 3Bar Map Sensor rated up to 200kPa of Boost (2bar/29psi). Data logging, Up to 10 channels of logging. Fastest Sample Rate 20ms. We custom build 2JZGTE engines and manufacture many custom parts for the Toyota 2JZ. We want our customers 100% satisfied. The item “Haltech Elite 750 series with 2.5m (8 ft) Premium Universal Wiring Harness Kit” is in sale since Saturday, April 30, 2016. This item is in the category “eBay Motors\Parts & Accessories\Car & Truck Parts\Computer, Chip, Cruise Control\Engine Computers”. The seller is “brangersracing9352″ and is located in Elizabethtown, Kentucky. This item can be shipped to United States, Canada, United Kingdom, Denmark, Romania, Slovakia, Bulgaria, Czech republic, Finland, Hungary, Latvia, Lithuania, Malta, Estonia, Australia, Greece, Portugal, Cyprus, Slovenia, Japan, Sweden, South Korea, Indonesia, Taiwan, South africa, Thailand, Belgium, France, Hong Kong, Ireland, Netherlands, Poland, Spain, Italy, Germany, Austria, Israel, Mexico, New Zealand, Singapore, Switzerland, Norway, Saudi arabia, Ukraine, United arab emirates, Qatar, Kuwait, Bahrain, Croatia, Malaysia, Brazil, Colombia, Panama, Jamaica.